Rebar is a short steel bar with ridges on it. Rebar is short for reinforcing bar. This can be a steel bar or a bundle of steel wires that are used as a tension device in reinforced concrete. Steel rebar serves the purpose of strengthening the concrete and adding a tensile device. Rebar is extremely commonplace throughout the construction process. The reinforcing beams are used in bridges, buildings, roadways, and nearly every structure built across America. Reinforcing steel can withstand much more tension than concrete and that is why we use Rebar to absorb the tensile stretching forces and keep the concrete from breaking under stress. Rebar will increase the actual tensile strength of the concrete or concrete structure. The more rebar inside of the concrete the better. We use tied rebar cages inside of cast concrete to get the most out of the steels tension benefits. There are different types of rebar each with different properties and prices. 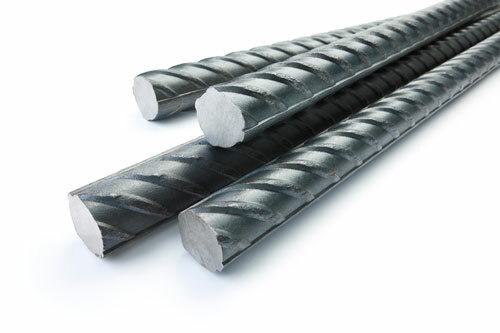 The most commonly used rebar is made of carbon steel and is called “black” rebar. The other types include European Rebar, Galvanized Rebar, Epoxy-Coated Rebar, Glass Fiber Reinforced Polymer Rebar, and Stainless Steel Rebar. Stainless Steel is the most expensive type of rebar and also holds up the best against corrosion. There are many different sizes of Rebar available depending on what you need it for, and the size/space requirements. The sizes vary greatly by length and diameter. The ends of rebar that stick out can be dangerous so we cover them with special steel-reinforced plastic caps or bend them over. While this may help prevent scratches and cuts, it does little to stop serious injury by impalement. This is why extreme caution must be used while working around Steel Rebar.